Major General Stefano V. Salamida was born and raised in Novara, Italy; he joined the Italian Air Force Academy in 1979, graduated in 1982 and subsequently attended the flight training program in Moose Jaw, Canada. During his operational assignments, he commanded two fighter Flight Units as well as an Operational Conversion Squadron, equipped with F-104. In 1997, after attending the Joint Senior Officer Staff Course, he served as a Military Assistant and Chief of the Secretariat of the Italian Deputy Minister of Defense. Promoted Colonel in 1998, has been posted to the Logistics Department at the Air Force HQ, and in 1999 has been sent to the US as the Italian National Deputy in the Joint Strike Fighter Program Office in Arlington, Virginia, where he served for three years. In this assignment, US DoD awarded him with the Meritorious Service Medal. In 2002 returned to Italy, having been appointed Commander of the 36th Wing based in Gioia del Colle, equipped with Tornado Air Defense and Attack fighters, where he served for two years. Back in Rome in 2004, he has hold the post of Chief of the Office for Ops, Training and Exercises, 3rd Division, Air Force HQ, and subsequently headed the newly created Net Centric Warfare Office in the Joint Forces HQ, C41 and Transformation Division. In 2005 he attended the first EU European Security and Defence College (ESDC) and, in 2008, the Industrial College of the Armed Forces, obtaining a Master of Science in National Resource Strategy at the National Defense University, Washington DC, USA. 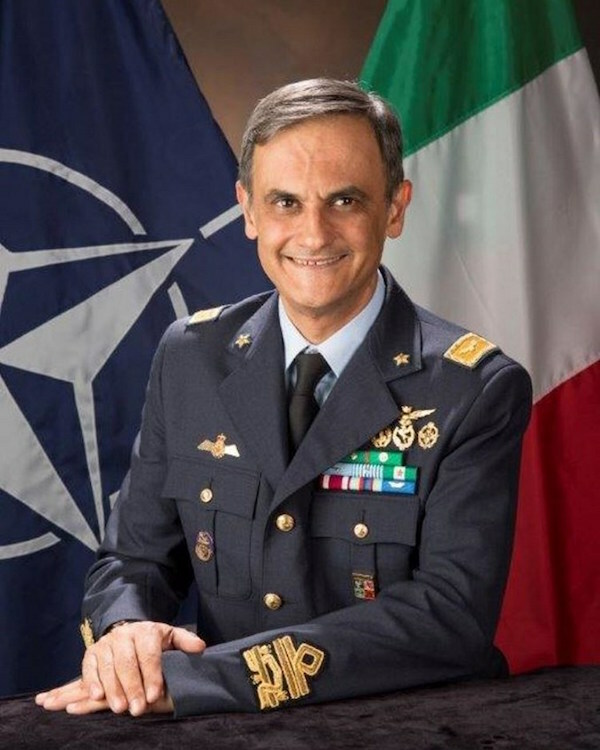 Promoted Brigadier General in 2009, he has been appointed Director of the Italian Joint Strike Fighter program and, from 2011 to 2013, he has been heading the Economic and Financial Department at the Italian Air Force Staff. From September 2013 to July 2016 he served as Chief, Logistic Department, Italian Air Force Staff. Promoted Major General in 2015. From March to July 2016 he also served as Deputy Commander of the Italian Joint Force Operational HQ. Since August 2016 he has been appointed as Supreme Allied Command Transformation's Deputy Chief of Staff Joint Force Development. Major General Salamida is a command pilot, has flown more than 3,200 hours. He is married to Flaminia and has two daughters, Carla and Laura.